I bought this book when it first came out (some time at the beginning of the year). A group of my Facebook friends were going to take the class that was offered via Oprah I believe, and I was going to do it with them. Ya. I bought the book, but I never made it to the classes, and I didn’t read the book until now. And as with everything else in life, there is a timing for everything and I truly believe I needed to have a few more experiences before reading the book. It is perfect for right now! Exactly what I need at the exactly the right time. This book intrigued me. As a trained storyteller, I learned a great deal about “the shadow” as it pertains to archetypes in storytelling and how to use storytelling in healing the psyche. This book seemed like a natural fit into my life and what I have already learned; it seemed like it would be a natural extension. Wow! That is a pretty big challenge. There is a reason it is called “the shadow”. It can be a bit scary to take an honest look at what we are feeling and why. Isn’t it easier to sit in judgment and blame someone else than to take 100% responsibility for our own thoughts and actions? Ya, I think so too! But I have realized in recent days, months, years that I need to take 100% accountability for everything that happened or continues to happen in my life. Whether it’s the abuse I endured as a child, the issues in my marriage, or what I perceive to be happening within the roller derby league I was practicing with. This book reiterates what I already believe and that is that “thoughts are things” and we create our own world based on our thoughts. When I think, “Well they don’t like me and are ignoring me and leaving me out because they don’t like me” then it sets that “wish” into motion and sure enough I get more of what I perceived to be true. This just shows me that I am feeling separate from others….separate from my self…separate from God/Love. Where there is separation, there is fear. Where there is fear, there is the shadow. Where there is shadow, there is dis-ease, pain, sadness. There are so many great thoughts in this book that really helped me look at things in different ways. If you are struggling with addictions of any kind, fear of any kind, lack of success…if you feel as though something is holding you back, then pick up this book and give it a good read. 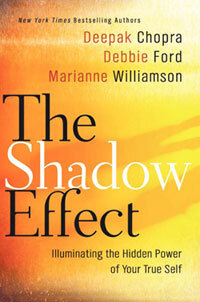 At the end of the book there is a test to see how the Shadow Effect is playing out in your life. I am happy to say that the shadow is not controlling me completely, and yet there is room for growth :). My eyes are opened now, and that is a good thing.